We’d love your help. 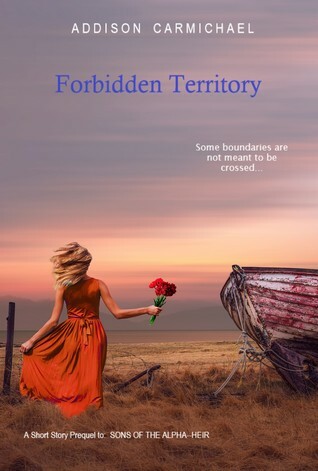 Let us know what’s wrong with this preview of Forbidden Territory by Addison Carmichael. Knocked unconscious in a storm along the Rio Grande River, werewolf Sophie Gabrielle wakes up to find that she had crossed over from neutral Colorado into New Mexico, were-Coyote territory. Worse, she was rescued by Tomas Duarte from the notorious Juarez Coyote Pack itself. And in spite of his dangerously charming Latin façade, Sophie has no idea what he plans to do with h Knocked unconscious in a storm along the Rio Grande River, werewolf Sophie Gabrielle wakes up to find that she had crossed over from neutral Colorado into New Mexico, were-Coyote territory. Worse, she was rescued by Tomas Duarte from the notorious Juarez Coyote Pack itself. And in spite of his dangerously charming Latin façade, Sophie has no idea what he plans to do with her. Or if he knows why she’s really there in forbidden territory in the first place. To ask other readers questions about Forbidden Territory, please sign up. Most of the times, reading nicknames and endearments is so cliche and corny. But the names Tomas used to call Sophie were so original and full of love. I would just automatically smile whenever a new name would come up. The only problem I have with this novella is that it is too short. I wanted to read more about Sophie and Tomas, and I definitely wanted a happily-ever-after for them. The prequel is perfect in every way and I look forward to reading book 2. I received a free copy and I am volunta Most of the times, reading nicknames and endearments is so cliche and corny. But the names Tomas used to call Sophie were so original and full of love. I would just automatically smile whenever a new name would come up. The only problem I have with this novella is that it is too short. I wanted to read more about Sophie and Tomas, and I definitely wanted a happily-ever-after for them. The prequel is perfect in every way and I look forward to reading book 2. This was a great short story but the ending broke my heart. It is definitely one to read. Hmm... I really like how Addison gives a prequel to get you ready for each book in the Sons of the Alpha series, and it does make it easier to get into since their short love stories! I've noticed that I love the books way more than the prequels though, (I LOVED Knight, and enjoyed Beauty and Her Beast) so definitely getting ready for Heir!! I really hope we get to see Neil again!! This is a short story and its the prequel for Heir 'book two' in the series. I love how the author gives a prequel for each book to get you ready for the next book in the Sons of the Alpha series. I received an advance copy of this book. I am voluntarily giving my honest review. Loved this great love story prequel. This is a great story with great characters that you will love. I really liked the twists. This is a must read. I received a ARC copy of this book and I am volunteering to do an honest review.